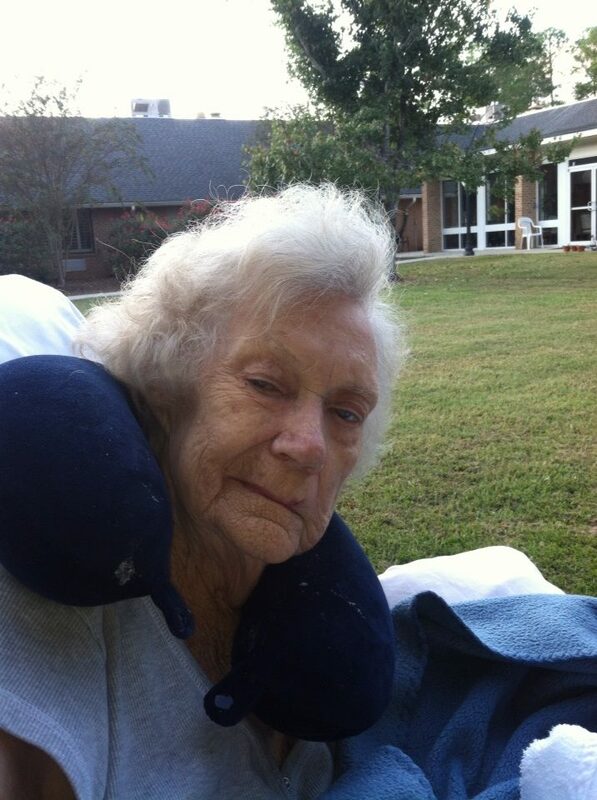 ← If you would like to send mom a card…..
10/3/14 Update on my Mom……. Mom has many friends. I get lots of calls asking how she is doing. I appreciate that. However, I suppose I need to do a better job of keeping her (and my) friends updated on mom’s condition. First a recap: A few weeks ago, mom suffered a major stroke. Her left side and her vision were impacted. We spent two weeks at the Coliseum Stroke Rehab Center, but then the Coliseum contacted us and said they felt that their rehab was doing more harm than good. They asked us for the names of three sub-acute rehab centers. We gave them three based on our knowledge and the recommendations of some friends. Pinewood Manor (Hawkinsville), Summer Hill (Perry), and Church Home Care (Perry). After calling all the centers, Church Home Care and Rehab http://churchhomerehab.com/ in Perry had the only opening. Mom was transferred there on September 11. While our hopes and prayers remain that mom will get at least partially mobile again, to the point that we can bring her home to care for her, we are also trying to be very realistic. Church Home Care is both a sub-acute rehab and a long-term nursing home. 10/03/14 Update: I go and visit mom every day. I leave Hawkinsville as soon as I get off work and go straight to Perry. There I am able to feed her supper each day. Then I visit for an hour or so and make my way back home. Mom is on Pureed food due to swallowing issues related to the stroke. Mom has little to no use of her left side. Her speech is now often slurred as well. Her vision is really bad. If you sit on her right side, she can usually see you. If you get on her left, she has no idea you are even in the room. Mentally, mom comes and goes. Her short term memory is really bad right now. People can visit, and by the time I get there each day, she has forgotten they came to visit. However, ask her about something from a year ago, and she can tell you more details than I can. I ask mom daily if she feels good, “Yes, I’ve had a good day.” is her usual answer. Are they treating you good here? “Yes, they are so nice”. Are you happy? “Yes, I’ve had a good day”. How did Therapy go today? “I worked hard today”. Are you getting better, “I think I’m getting a little better each day”. So at least she seems pretty content. She asks every day about her dog, Fetch. In fact, she asks about Fetch before she asks about me or Vonnie. But that’s okay. I’ve taken Fetch once to see her, I’ve got to do that again soon. Bottom line is that she is doing okay. She is not yet getting better, but she seems as content as one can expect. Just keep her in your prayers. Me: I’ve also had many of you ask how I am doing. Well, it’s been tough. I am an only child, so the decisions and bulk of the issues fall to me. But’s that’s okay. I am surrounded by an incredible support group. Vonnie has been by my side (and mom’s side) this entire journey. She has been incredible. My children visit mom and encourage me. My cousin Donna has been incredible. She visits mom often and is always available on a day that I am out of town and can’t visit. She has been such a blessing. My cousin Sherry and my cousins Rebecca and Jake have also been great! The support from the community and churches (mine and mom’s) has also been overwelming. From email, to cards, to flowers, to visits, to facebook posts, I know you care and I appreciate every one of you. My philosophy through all of this is this: I am praying for mom’s healing. I am praying as David did when his son was sick. In 2 Samuel 16-22, David prays and asks God to heal. But the boy dies. Then look what happened. (Verses paraphrased and shortened). 20 David got up off the floor. He went into the Lord’s tent and worshiped. 22 David answered: While he was still alive, I went without food and cried because there was still hope. I said to myself, “Who knows? Maybe the Lord will have pity on me and let the child live.” 23 But now that he’s dead, why should I go without eating? I can’t bring him back! Someday I will join him in death, but he can’t return to me. I want God to heal mom, but God knows better than me. He also promised that ALL things work together for good for those that love God and are the called according to his purpose (Rom. 8:28). So if God does heal mom, then may He get the glory. If God does not heal mom, I will still worship him and give all Glory to God. Whatever happens, it is my prayer that God be glorified. That is our purpose on earth. So, yeah, it’s tough. It’s the hardest thing I have ever been through. Dad’s death was tough, but it was brief. This is lingering and is tiring. I have new respect for the care-givers of this world. But God is good and I am just going through things that many of you either have or will go through. How people do it without knowing God is in control, I don’t know. But I am good. Taking one day at a time. Please continue to pray for mom. Posted on October 3, 2014, in Personal and tagged Mom, Personal, stroke. Bookmark the permalink. 6 Comments. PRAYING DAILY FOR YOU ,YOUR MOM AND FAMILY.I KNOW WHERE YOU ARE COMING FROM I HAVE BEEN IN YOUR SHOES. Shelly, thanks for the update on your Mom…and yourself. Truly, it breaks my heart to hear your Mom’s condition. On the other hand, you are so blessed to still have your Mom here on Earth. What cherished memories I’m sure you have. Your Mom is such a sweet lady! Please know how much your Mom meant to me as a teacher and what a blessing she was to me when I lost my mother. As you stated, “ALL things work together for good for those that love God and are called according to His purpose.” Mrs. Berryhill, you, and Vonnie are in my thoughts and prayers. So touched by your story. I have always loved your mom – she taught me algebra and wow – what a good teacher. I wanted her for every class I had. I think of and pray for her healing daily. She is such a remarkable woman and you are so lucky to have her as a mother. Prayers for you and Vonnie as the caretakers. Caretakers have the hardest job of all. Please keep us updated. Love to Ms. Jackie!! God Bless you Shelly. You and your entire family are in my thoughts and prayers. Moms are the foundation of our character. Your Mom is a rock, and it shows in you. I’m certain she couldn’t be more proud. Praying for your mother and your entire family. My mother-in-law went quickly at 91 and it was such a blessing on all of us..including her. I know this can’t be easy on you Shelly, stay strong, you are a good son.